One of my favorite features is the covered porch in the backyard, flanked by open patios on each side where the family room opens out to. It's a huge double lot, so there's plenty of room and really the backyard has become a bit of a retreat for me - something I never had in all those years at the old house. On one side, I have a patio table with an umbrella and a Bliss recliner on top of a pretty patio rug with lots of potted plants, including my tomato plants, since I never got around to digging a vegetable garden. I often grab my Kindle, go out and lay in the recliner, pull the sun shade over my head, turn on the radio and sometimes a little fan, and just kick back to soak up some vitamin D. Sometimes I just close my eyes and listen to the birds singing and doze off for a second. Off to the right are a few neglected herbs, since I'm now growing dill, parsley, sage, chives and oregano in the Aerogarden in my office. It's one of the newer LED versions and boy did they take off! On the other side is the porch swing, a chaise and my patio deck box where I keep my gardening supplies. In the center, under the covered porch, is a glass top pub table and chairs, underneath a ceiling fan, where I sometimes do some blogging work. There's my old gas and charcoal grills, and my new pellet smoker grill. (I need to go hang out at my buddy Smokin' Don's blog and learn some stuff! ), and just off the porch, a picnic table with an umbrella for when we want to munch on something like watermelon or drippy Popsicles or ice cream cones with the kids. Seems nobody here planted much of anything, or else it didn't survive, so I planted a small garden of mixed perennials all around the patio - butterfly bush, trumpet flower, lavender, some reblooming daylilies, a lantana and a hibiscus bush - and stuck a couple garden spinners on each patio and bird feeders on each corner of the covered porch, under which is a lovely sunflower garden my birds have planted for me. It's really become my little piece of heaven on earth, and I spend time out there relaxing as often as I can squeeze it in, usually with Boo boy in my lap or nearby. Oh my gosh... that went on for awhile. Sorry y'all - guess I'm feeling chatty! Well, if you're still hanging in there with me, all of that was to say that the biggest benefit of having a covered patio is that it sure makes a world of difference when it comes to summertime grilling in this southern heat, and I have been burning it up out there! Now that the unofficial beginning of summer has arrived, I thought I'd bring you a new beer marinade for grilling chicken. Why beer? Beer doesn't really add a lot of flavor as would wine or liquor, but it will infuse some tones from the beer and with all of the craft beers available now, why not? The biggest contribution from beer will be its tenderizing ability thanks to its acidic nature. There are also some studies that indicate some properties in beer can help reduce carcinogens from the charring process that occurs during grilling. I used drumsticks because I'm trying to work my way through the deep freeze and that's what I found first, although any cut of chicken will work with this marinade of course. I like to use a blade tenderizer whenever I use boneless, skinless breasts though, and remember they take much less time to cook, so take care not to overcook those. I am not a big beer drinker, but I recently picked up some of this seasonal New Belgium to try. It's a pale lager with hints of citrus and peach so I figured it would work out just fine. Put the chicken in a bag, add the beer, olive oil, cider vinegar, dried thyme, salt and pepper. Squish everything around to mix it up good. Place bag into a container and refrigerate. Trust me on this because the first time your bag leaks a gooey mess all over your refrigerator, you will wish you had put the bag in a container of some kind! Let the chicken marinate for about 4 hours, or overnight. Drain the chicken and discard the marinade. Pat chicken dry and season with salt, black pepper, garlic powder, onion powder, paprika and Cajun seasoning. Let chicken rest at room temperature while you preheat grill to 450 degrees F, with all burners on. I recently had the chance to try Southern Seasoning from Full Moon BBQ (look for my review soon) and I used that here in place of the salt and pepper. The ingredients are proprietary, so I don't know what exactly is in it, but it's definitely a great all purpose seasoning! Turn off half of burners on your grill to form an indirect heat side, brush grill grates with oil and grill chicken, over indirect heat, turning several times for about 45 minutes, or until internal temperature registers 165 degrees F for white meat, 175 for dark meat. French dressing makes a great basting sauce for the grill, so I decided to use that here since we always have French dressing in the house. It's The Cajun's favorite for salads but he loves putting it on pizza too. Yes we put French dressing on our pizza down here, and it started right in Biloxi, but try it as a grill basting sauce y'all. It is delicious! Brush the chicken with French dressing the last 15 minutes, but if that just seems too foreign to you, then brush them with barbecue sauce if you prefer. I actually brushed half of the chicken with French dressing and the other half with Alabama white sauce, something else I also got to try from Full Moon BBQ. Both are wonderful. This chicken is perfectly delicious served just as it is. Doesn't that look scrumptious? Or, serve it with a drizzle of regular tomato-based barbecue sauce or Alabama white barbecue sauce at the table. 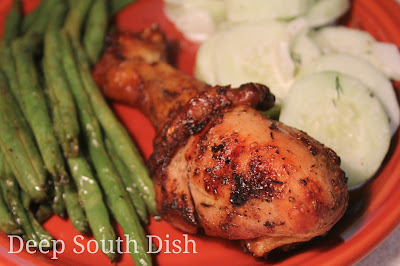 I served this with roasted green beans and a creamy sour cream and Vidalia onion cucumber salad. I have been eating the heck out of cucumbers lately. And watermelon! Tis the season. Combine ingredients in a glass bowl or zipper bag, add chicken, seal and turn several times to distribute ingredients. Place bag into a container and place in refrigerator, marinating for at least 4 hours, or overnight. Drain off marinade and discard. Pat chicken dry with paper towels and season. Let chicken rest at room temperature while you preheat grill to 450 degrees, with all burners on. Turn off half of burners to form an indirect heat side, brush grill grates with oil and grill chicken, over indirect heat and with lid closed, turning several times for about 45-50 minutes for bone-in dark meat, 35-40 for bone-in white and 20-25 for boneless, skinless chicken breasts. Actual cooking times will vary depending on the size of the chicken, so always check internal temperature - 165 degrees F for white meat, 175 for dark. Brush with French dressing the last 15 minutes. Let rest about 5 minutes before serving. Serve as is, or with a regular tomato based barbecue sauce or Alabama white barbecue sauce at the table. 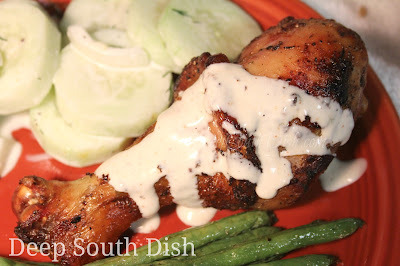 Try the creamy Vidalia Onion salad dressing for basting. You may have a new favorite? Oh I'm sure Pat! I will definitely try it. Looks yummy. I know about cooking from whatever is at the top. Ha. I really need to stop buying and eat from my freezer for a bit. Green tomatoes I have but no watermelon. I'll have to go look around. I love watermelon. Gpt neighbor here! Sounds like a great thing to try out next time we're wanting some chicken! The pictures make it look DELICIOUS! Thanks for sharing! You're welcome & I hope that you enjoy it! Hi - I think your website and FB page are fantastic! In my opinion, recipes and food from the south cannot be beat. I lived near Paducah, KY for 11 years, so I know what I'm talking about! Thank you Jeanne Marie & welcome to the Deep South Dish family! Thanks Don! Keeping it pretty basic so far - chicken, hot dogs, burgers - but you know I'll be a callin' afterall, you are really the reason I bought one! 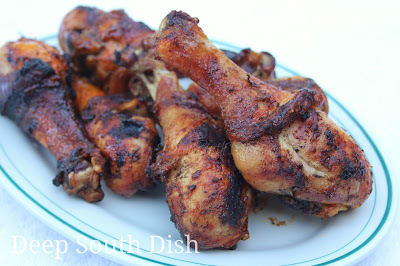 I often do beer in my marinades and have a great recipe for beer brined hot wings. Love that Alabama white BBQ sauce, tasty stuff. Enjoy that pellet cooker, I'm sure that you'll master it in no time. started cooking southern but Im not too good at it yet, maybe because I dont have the right cookbook....lol. Thank you for the opportunity.